Ever wonder why some fundraising events seem to rake in the cash while other people struggle to break even? Ever felt like there has to be some “magic bullet” that everyone else has that you just don’t know about? I definitely know the feeling. When I first started learning how to put on a fundraising event (which happened to be a gala), I had no idea what I was doing. Let me tell you that when I’m nervous about trying something new, my first line of defense is to try to learn everything I can about a subject. I stress research. A lot. And I was definitely a researching spazz then. There’s SO much information out there about fundraising events, which I was incredibly grateful for, but I realized that not all of it made sense. In fact, I quickly learned that some of the strongest “advice” was coming from people whose events were struggling to make a profit. I also love researching other industries (because I’m a big ol’ nerd) and trying to figure out how principles that make someone else successful could apply to a different area. What I found as I created my own successful events, and then by also getting results for clients was that successful nonprofits and successful businesses aren’t all that different. Now, before you light up the torches and break out the pitchforks, hear me out. Let me start by saying there are some really weird beliefs in the nonprofit world that “for-profit” or “corporate” are bad. Like wanting to make money makes you evil. I didn’t start my career in nonprofit work, so it actually surprised me how much I ran into this mentality. The thing is though that money isn’t evil. Wanting money isn’t evil either. It’s all about intention. Having this negative idea of business and money is the thing that I believe holds people back the most when it comes to fundraising. Making asks feels “gross and salesy” instead of like giving people an exciting opportunity to contribute. People who have money are seen as greedy instead of as generous supporters. Struggling every day to keep your doors open becomes noble instead of having pride in being able pay your amazing hardworking team well enough so they can afford to stay doing the work they love. In short, this mentality is a hot mess. After all, the ultimate goal for a nonprofit is for people to give you money so that you can use it to help others. I’m a huge believer in getting goals. I love doing it (and minding other people’s business by helping them do it too) because it allows you to be honest about your hopes for the future. Sometimes it’s hard to admit out loud the things that we want to have, be, or achieve. Goal setting allows you to hope for more than you currently see as possible. It gets you thinking about your true potential and moves you toward being a better version of yourself. That my friend, is a beautiful thing. Successful businesses and fundraising events all start out with a goal in mind. It gives you a framework to make decisions (allowing you to say no to doing AllTheThings (which is major), because you know what your target is and what you’re trying to achieve. Figuring out what to do becomes easier because something will either move you toward your goal, or not. Setting goals also keeps you moving. Think about it- when things are going well and you get a new sponsor, or a huge in-kind donation, you’re pumped! The whole day feels awesome all the sudden and you’re pretty sure this is how Beyonce wakes up feeling every morning. And what does that make you want to do? Make more calls so you can get more people to say Yes! That feeling of being a badass ready to take on the world to help your cause? Yeah, that would be the dopamine being released in your brain, positively reinforcing your behavior for you. On the flip side though, things are going to go wrong. There will be days when nothing seems to be working. Picking up the phone will feel like an ancient form of torture. People are going to say no. And on those days, taking a look at your goals will help you stay focused and keep moving forward, even though everything is the worst. But setting a goal is a waste of time if you don’t make a real plan to make it happen. And if it’s a big enough goal, it might just turn into a nightmare. This is because once you set a goal, a part of your brain starts to believe it’s possible, while to other part doesn’t quite believe you yet. This is pretty much what happens to us all with New Year’s Resolutions. So you wrote down a list of all the things you want to achieve. Your brain goes “Yeah, that sounds nice...and?” while giving you some serious side eye. Making a plan and setting deadlines makes your goals real. It lets both parts of your brain know that you mean business. And this is where the magic happens. Your brain is designed to answer any question you give it. So now you will automatically start thinking of ways that your goal can happen. Your brain will start to process your overall goal and break it down into smaller more manageable chunks. Even if you’re dragging your feet because you still have doubts (read: because you’re scared as hell) or as your plans change, your brain will keep looking for solutions. Making a plan and setting deadlines will also help you decide what to do, when. This is especially great for teams because you can lay out all the projects you have going on. You can honestly see if you can really pull off that event idea in 2 and a half months, or if you should actually give yourself more time. Realistic deadlines that don’t have you breathing into paper bags under your desk means you have the time, energy, and sanity to thoughtfully put on a better event. Ever heard the phrase “there’s no such thing as a free lunch”? Well, there’s no such thing as a free fundraiser either. I’ve talked to so many people who’re trying desperately to get more money for their nonprofit, and think an event is going to be the thing that saves them. When I ask what their budget is for the event, the answer is often that they want to get everything donated. Okay cool. I’m all for free stuff! But when I ask them who they already know that would donate the things they want, I usually get a blank stare. This is a HUGE red flag. Like on fire, red. This is actually the biggest clue that an organization probably shouldn’t have a fundraising event. I totally get the fear, and wanting to stay afloat. The idea that you and your team work so hard only to struggle makes my heart hurt. But the reality is that at this point an event probably isn’t going to save you. It’s more likely to drag you thousands of dollars down into a hole if you don’t have the right framework in place. Here’s the truth- all events take some sort of investment up front. Usually it’s a combination of 3 things- money, time, and people power. Think of it as a triangle. All the sides stay connected, and as you have more or less of one thing, you need to be able to make up the difference on the other sides. If you’re small and don’t have a lot of money, then you need to get out there and make the relationships you need so you have some people power. You also have to give yourself more time to plan. If you don’t have a strong network, you’ll have to spend time and also maybe some money to get the word out about you, the work you do, and the impact you have on the community. Nonprofits that are successful and have the money, can hire professionals that save them time and provide the people power. It’s important to know what you can invest in each of these three resources before you plan an event. Another thing that successful businesses are great at doing is telling a compelling story. And that doesn’t mean that they just go on and on about how awesome they are. Okay, so maybe they do. But the key is to do it so that the people you want to attract will actually care. Have you ever heard someone tell a story about themselves and thought, “Ugh, this person is so full of themselves and gross”, then heard someone else talk about themselves and you thought they were amazing and wanted to get to know them more? The difference between the two actually had nothing to do with them. It was really about you. Nonprofits and businesses that are at the top of their game are able to talk about themselves and what they do from the standpoint of what the other person would care about. Your event messaging should be the same. Yes, you do great work for the community, but why should other people bother listening to you? If you want help getting clear on this, check out this workbook! Also, fun nerd fact- did you know that our brains are hardwired for stories? Back in the caveman days before people were writing, telling stories is how they kept history. This is how they passed on who they were as a community and what would probably kill you if you tried to eat it. Not much has changed for us in that area. Humans are still geared toward story telling. The cool part is that it’s not even the details of a story that stay with us- it’s how it makes us feel. A major part of being able to tell compelling stories (and not boring people to tears) is being able to connect to their emotions in some kind of way. After all, emotions move us into action. Think of all the ways you can tell your story that really moves people. Go over every part of your event, whether it be your website, your sponsorship letter, your social media posts, and the experience at your actual event- what can you do to tell a story that matters? It doesn’t much matter how compelling your story is if you’re talking to the wrong crowd. This is a huge one in business because it’s where you connect what your goal is and who your customers (or in the case of nonprofits, supporters) will have to be for you to reach that goal. For an event, this can be the difference between a wildly successful event, and ending up deep in the red. Once you set a fundraising goal you then have to be really honest with yourself about who could help you reach it. And then you have to build an event around them and only them. This is such a hard thing to do, because people who do work for a cause have huge hearts. The last thing they want to do is make someone feel left out. But I can’t stress enough how important it is to stand strong in this! Let’s say, for instance you have a goal to raise $50,000 at your next event. For simplicity’s sake, let’s also say that you’re selling tickets only instead of having an auction too. Let’s say you did some research and found out that the venue you like (and can afford) can hold up to 200 guests. Sounds good. That means that in order to make $50,000, you need to sell tickets for $250 each. Do you know about 200 people that will pay that amount? Let’s say the answer is no. Your tribe is made up of folks that can definitely pay $100 per ticket, though. You event just grew to 500 people. Can you afford to invest in an event for 500 people (think of the triangles of resources above)? Do you have access to a space that’s big enough? If you do, then awesome! Go forth and prosper! But if you don’t it means you should take another look at how much you want to raise, or who in your tribe you’re going to market to. These are the honest questions you have to ask yourself. I know the idea of leaving people out based on money feels really crappy, but that doesn’t mean that you are ignoring them forever. There are so many creative event ideas that you allow you to engage all of your tribe so that they can support the cause in a way that allows them to shine brightest and will feel the best for them. The final business practice that I found to get your fundraiser running successfully is to give people exactly what they want. This means planning the perfect event for your ideal guests. This might sounds like trying to shoot at a target blindfolded, but it’s easier than you think. The best way to give people exactly what they want is to ask them. That way you don’t waste any of your resources (time, money, or people power) making wild guesses and getting it wrong. Sure, you will always be experimenting with new things to keep people interested, but that will be much easier to do when you’ve engaged with them enough so that you can make better guesses. It’s like buying a gift for someone you barely know, versus buying something for a close friend. It’s much easier to get a great gift for a friend, because chances are they’ve told you over and over what they like in different ways. People are always telling us their preferences- we just have to learn to listen. Maybe your biggest sponsors go to certain types of events where they can network. Maybe they like going to things where they can bring their kids. Maybe they’ve said they hate waiting in long lines. Maybe they casually gave you a compliment about how you interact with them. These are all little nuggets of gold that you can use to make the perfect event for them. The other thing about asking for advice is that people love giving it. And they really love when they see that someone listened to what they said and did something with it. Now, that doesn’t mean you should do whatever random thing anyone says. Because we all know some people just like to complain. For instance, I once had someone say that they hated the dancing at the end of one of the annual events I plan. To them the music was too loud and they didn’t like it. I thanked them for their feedback, because I really do believe all feedback is useful, and did a little more digging. Many more of our guests said they thought the dancing was fun and really liked that it felt like a celebration. Since the people who said they liked the dancing were our ideal audience and also made up the majority of the party, I made the decision to keep the music. Getting feedback from everyone is useful because it helps you get really clear on what your ideal tribe would like. It also helps you weed out the people that you aren’t a good fit for which saves you from spending resources on the wrong people. I hope this helped you see what successful businesses and successful fundraising events have in common. These are also the things that ultimately make a successful, impactful nonprofit or charity. I hope this strengthens your mindset towards what is possible. Don’t be afraid to dream big when it comes to your fundraising goals and what impact you want to have on your community. Most importantly, I hope this inspires you to get out there and start taking action with your tribe! I’d love to hear what you think. Do any of these surprise you? 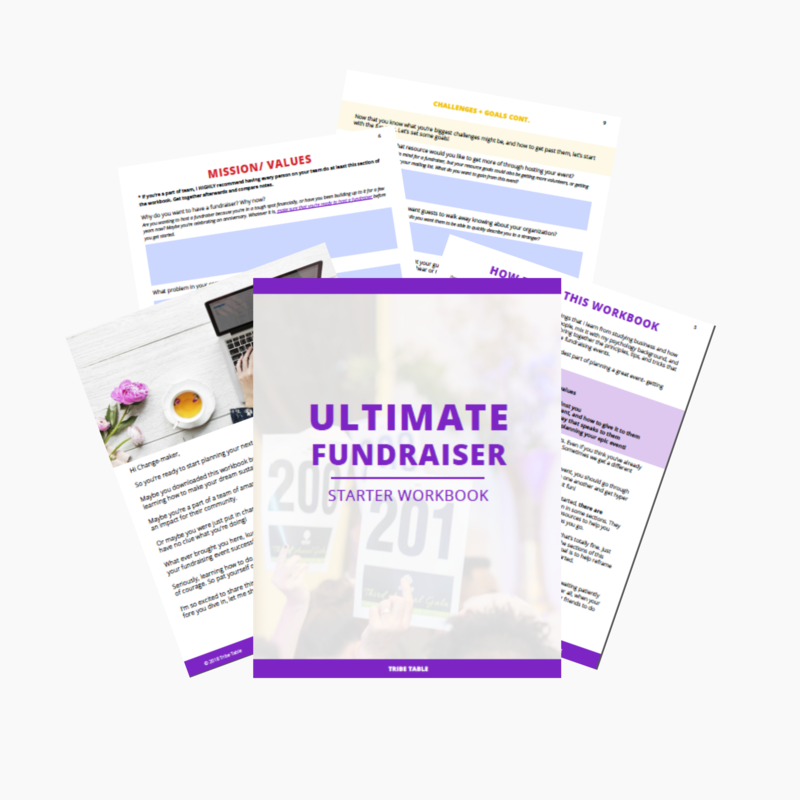 Do you have other practices you’ve found in business, marketing, or any other industry that you’ve applied to your fundraiser with great results? Inquiring minds want to know. Leave a comment for the Tribe below.